What can be more confusing than figuring out where you can and can’t park at a car lot? Without the proper signs, it’s hard to find where you need to go in a place with so many parking spaces. 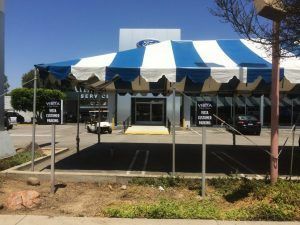 Vista Ford is a dealership in Woodland Hills, California that we have worked with for many years. We’ve assisted them with many different forms of indoor and outdoor signage and this time they needed parking signs. We’ve made different types of parking signs for them in the past and this time they asked for customer parking signs. The business faces Ventura Blvd., which is a major street that runs through the San Fernando Valley. If you’ve driven through the area before, you’re sure to have seen at least one of the large outdoor signs they have. They needed four posts in total and we made eight single-sided signs so each post would have two sides. One to face the customer inside the lot, and the other to face the major street so a customer entering the lot would know exactly where they need to go. Not only does this help the customer navigate, it is also very inviting for a customer to see that they can find a parking spot easily. 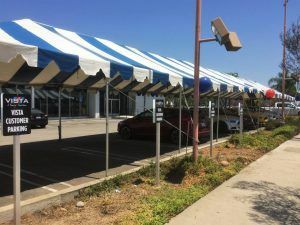 Especially in the congested Los Angeles area, finding parking can be one of the most stressful parts of our day. Making the process easier for your customer will help start off their experience with your business on a positive note. The reason businesses seek out a custom sign company like ours is because they don’t want just another generic sign. We can digitally print your signs which means that you have endless style and color options. 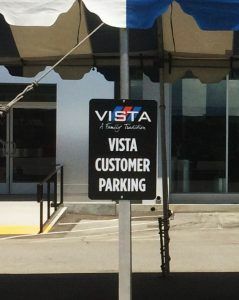 Vista Ford wanted to incorporate their logo with their tagline, “A Family Tradition” and specify “VISTA CUSTOMER PARKING” on the sign. The logo looks great against the black background they chose and the white font contrasts well so a customer in a car can read what it says. The digitally printed vinyl was applied onto aluminum backers. After attaching the backers to the aluminum poles, we installed them into the planter near the sidewalk. Aluminum is our go-to material choice for outdoor signs because it is lightweight, durable, and easy to work with so we can create any shape you want. 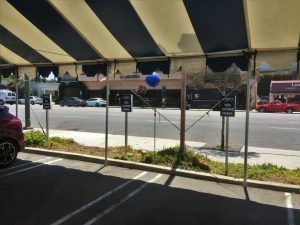 If you’re in need of any type of parking sign for your business, you can feel free to contact us for a quote so we can start helping you design your dream parking sign.